"Catch him alive." This was the order from the Chinese authorities, given to a special taskforce set up to investigate the October 2011 killing of 13 Chinese sailors on the Mekong River, according to the group's leader Liu Yuejin. Liu, 54, the director of the Ministry of Public Security's anti-drug bureau, told the Global Times in an exclusive interview about the team's experiences investigating the murder case. Despite having been a police officer for 30 years, Liu said the Mekong River case seemed to be an impossible mission at first. It was the first time that Chinese police were conducting a manhunt for criminals who were all foreigners based overseas. Chinese police knew little of the suspect Naw Kham when they received the case. The only information they had was a photo of Naw Kham from 20 years earlier, and that Naw Kham was an armed gang leader in the Golden Triangle. Some analysts had even said the hunt for Naw Kham could be as difficult as the hunt for Bin Laden. Chinese police needed to delve into the criminal underworld to find him. Naw Kham, the leader of the largest armed gang in the Golden Triangle along the Mekong River, was finally arrested and sentenced to death in China. Liu said that this sent a clear message around the world that the interests of Chinese citizens overseas and the Chinese State could not be violated. From 2008, Chinese police began to receive reports of murders along the Mekong River. Already, 16 Chinese had been killed and six injured. "At that time, we could not find out who was responsible," Liu said. The truth became clearer after Naw Kham's gang and a small number of Thai soldiers hijacked two cargo ships on the Mekong River, the Huaping and Yuxing 8, and murdered the 13 Chinese sailors on board, on October 5, 2011. The Chinese foreign ministry released details of the case on October 10, 2011. On October 13, China communicated to the governments of Laos, Thailand and Myanmar the Chinese government's determination to solve the case. "We heard rumors that Naw Kham controlled the waterways of the Golden Triangle, and assumed drug traffickers in the area would be in contact with his gang," Liu said. The first step was to target a drug trafficker in the northern part of Myanmar, who was part of the network. The drug trafficker was lured into China and arrested. From him, Chinese police tracked down a low-level gang figure, Yan Xiangzai, who traveled to northern Myanmar every two weeks. Chinese police cooperated with local authorities to catch Yan on his boat. After catching Yan, Chinese police expected to have to bring him back to China in disguise. "Police had to face two different risks: the gangsters of Naw Kham and the foreign police forces who did not know the truth," Liu said. By the end of 2011, Chinese police had compiled profiles of various gang members. They knew that the top leader was Naw Kham, followed with his lieutenants Sang Kang, Yi Lai and Weng Mie. They also knew that the gang's lair was Sam Puu Island on the Mekong River, and about 100 armed criminals patrolled its banks, profiting from drugs and extortion. Chinese police first identified and caught Yi as he was driving away from Vientiane, Laos. Yi confessed that Naw Kham plotted the murder of the Chinese sailors, and that he had ordered them to "kill all the people on the boats." The gang was angry they hadn't protection fees and believed the two boats had been expropriated by the Myanmar military to attack them. During the search, Naw Kham vanished at least three times just as the Chinese police were closing in. Liu said that this was largely because the Chinese police were limited in what they could do overseas. They had to launch appeals before undertaking operations and cooperate with local police. At the end of 2011, Chinese police located Naw Kham at a village by the Mekong River in Boqiao Province in Laos, the hometown of one of Naw Kham's mistresses. Chinese and local police encircled the village, but some local officials and villagers obstructed them. "We hit a stalemate. Police were not allowed to enter the village. Even though the local police head was with us, provincial officials were on the other side," Liu said. "The deadlock lasted hours, and it was getting dark. According to local customs, the search would have to be suspended after sunset." Police then turned to technology. China's Beidou positioning system provided tremendous assistance in identifying and catching Zhan La, a Myanmese man who represented Naw Kham's business interests. Zhan told police Naw Kham was hiding in the mountainous regions of northeastern Myanmar. Chinese police then monitored tents spotted in the mountains to ensure they had the right people. Catching them would be tough. They were isolated, and the nearest road was over two kilometers away. "One plan was to use an unmanned aircraft to carry 20 kilograms of TNT to bomb the area, but the plan was rejected, because the order was to catch him alive," Liu said. Local ethnic armed groups and the Myanmar military aided the police, which meant it took them five days to reach the site; however a hidden sentry spotted them and opened fire. Gunshots woke Naw Kham and allowed him to flee yet again. On April 25, Chinese police received the news that Naw Kham had appeared in northern Myanmar, and Chinese police worked with Lao police to prepare an ambush along the Mekong River. That night, Naw Kham and two followers were arrested when they reached the riverbank in Boqiao Province. Chinese police led the operation, because the governments of Laos, Myanmar and Thailand said their forces weren't available. "No one on the taskforce died," Liu said. Naw Kham and three members of his gang were sentenced to death on November 6 last year for killing 13 Chinese sailors, according to a verdict from the Intermediate People's Court of Kunming. 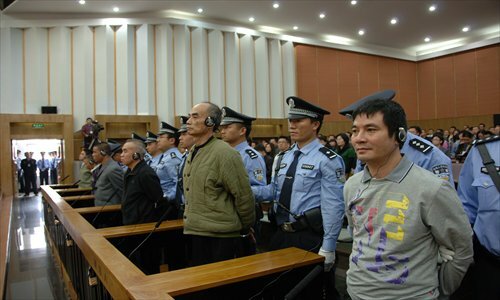 On December 26, the Provincial Higher People's Court of Yunnan maintained the sentences, rejecting appeals. Dates for the executions have not been set. Except Naw Kham, the people in this story are identified by their Chinese names.